These super easy skillet meatballs only have four ingredients and they come together in just a few minutes. If you want to be extra fancy, you can add a little grated Parmesan to the meatball mix, or even some frozen spinach (thaw and squeeze out the moisture first). But if you ask me, they’re insanely delicious just the way they are and I’m a big fan of the easy, no-fuss prep. Half way through making these Skillet Meatballs and Marinara I realized that it probably would have been about the same price (or maybe less?) 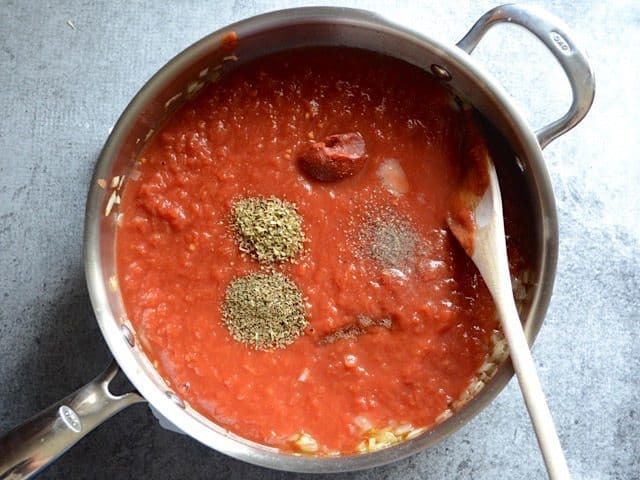 to buy a jar of marinara at the store and just pour that into the skillet. So, if you want even faster prep for this meal, go ahead and use jarred marinara sauce instead of making your own like I did below. I’m a big fan of having good food fast! 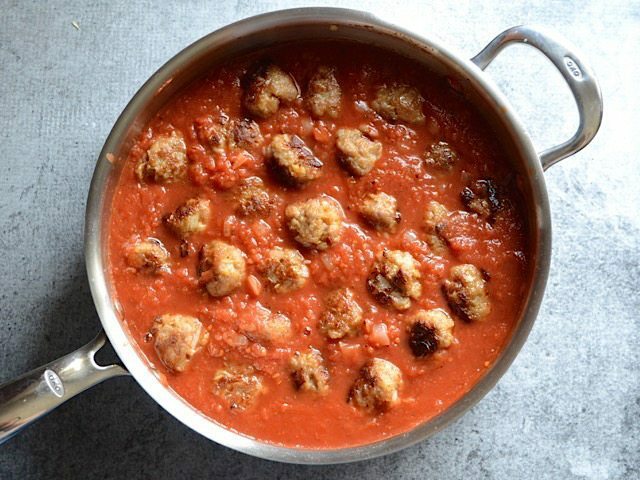 These quick and easy skillet meatballs are made in one skillet with marinara and pack a huge flavor punch. They're my new weeknight dinner favorite! 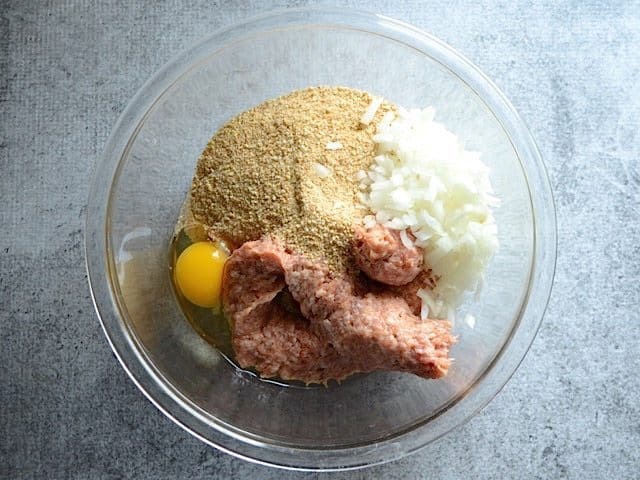 To make the meatballs, squeeze the Italian sausage out of the casing and into a large bowl. Add the breadcrumbs, egg, and diced onion. Using your hands, mix the ingredients until combined. Form the mixture into about 24 ping pong ball sized balls. Heat a large skillet over medium flame. Add the olive oil and tilt the skillet to coat. Add the meatballs and cook until browned on the outside (a couple minutes on each side). 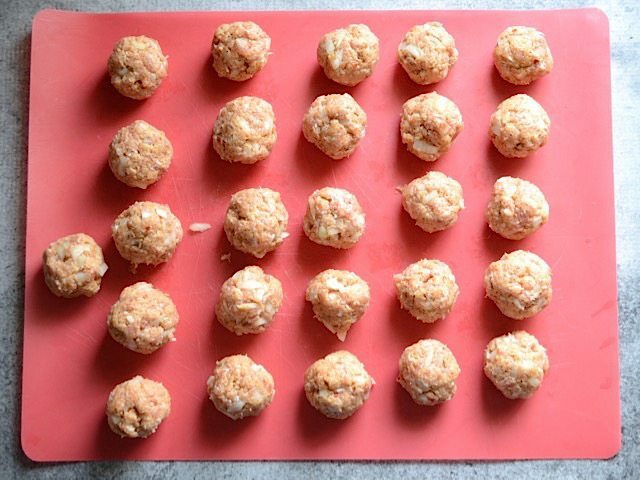 Work in two batches if needed to give the meatballs room to movel around. 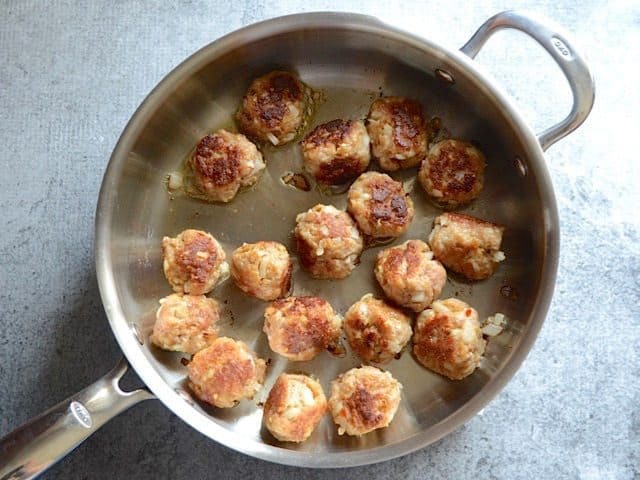 Once the meatballs are browned, remove them from the skillet to a clean plate. 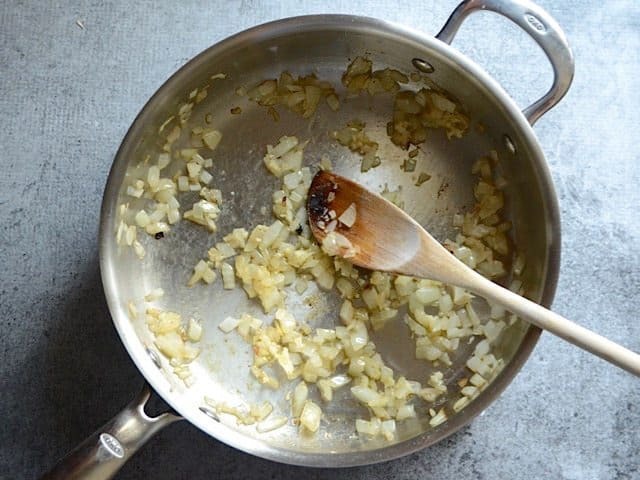 Add the second half of the diced onion to the skillet, along with two cloves of minced garlic. Sauté in the leftover oil and fat from the meatballs until soft and transparent. Once soft, add the crushed tomatoes, oregano, basil, salt, pepper, brown sugar, and tomato paste. Stir until the tomato paste mixes into the crushed tomatoes. Add the meatballs back to the skillet and gently stir to coat them in sauce. Place a lid on the skillet and let the meatballs simmer in the sauce for 15 minutes. Cook the pasta while the meatballs simmer. Drain the pasta and serve each bowl with pasta, four meatballs, and a scoop of sauce. 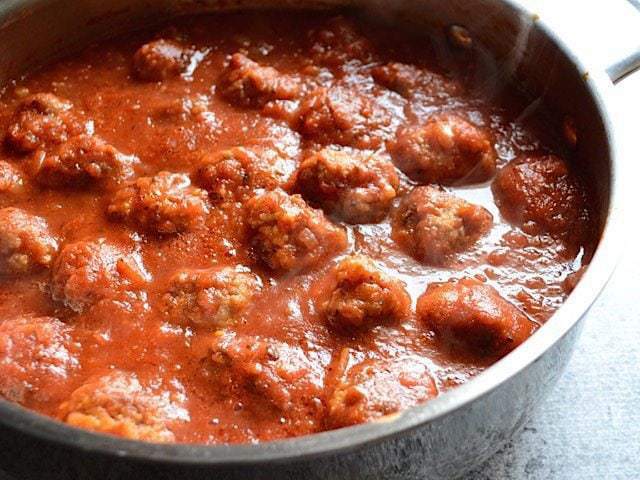 To use store bought marinara, keep the browned meatballs in the skillet and pour a large jar of sauce over top. Allow the sauce to come to a simmer, then let the meatballs simmer in the sauce (with a lid) for 15 minutes. 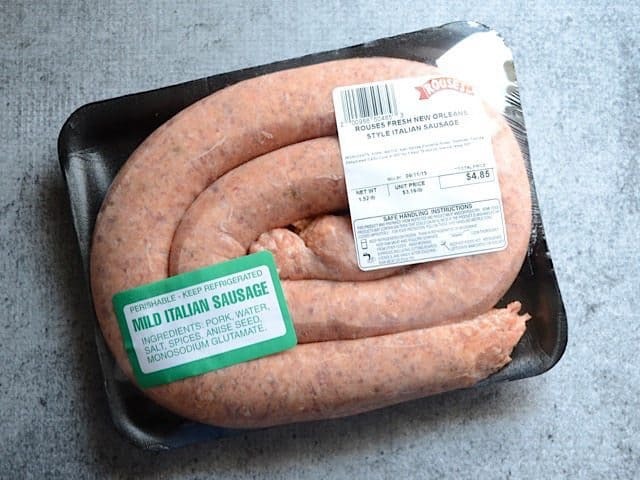 Italian sausage is great because it has a ton of herbs and spices already mixed in, which means less work for you. I usually buy Johnsonville sausage, but noticed this store brand which was far less expensive. This package is 1.5 pounds, so I portioned off 1/2 lb. and froze it for later. 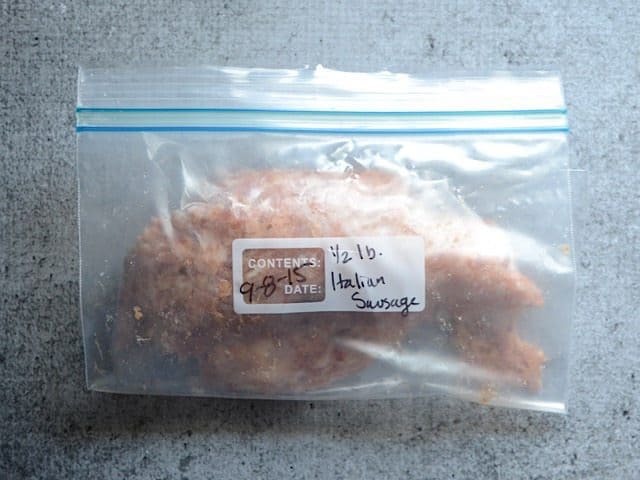 You only need one pound of mild, sweet, or hot Italian sausage for this recipe. This extra little 1/2 pound of sausage is going to come in handy later on in the month! Add 1 lb. 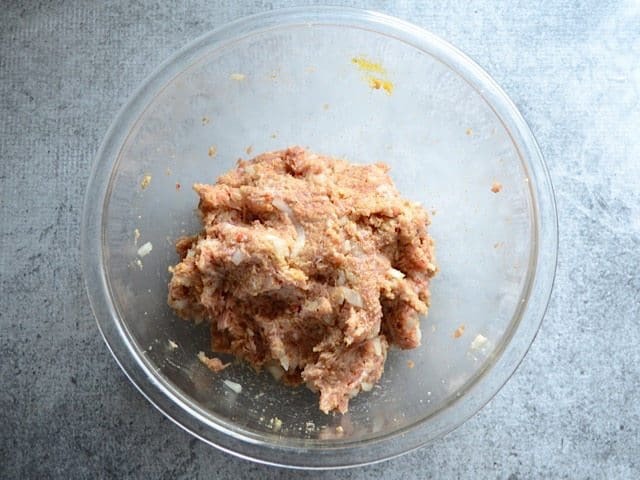 Italian sausage to a large bowl along with 1 cup breadcrumbs, 1 large egg, and 1/2 of an onion (finely diced). Use your hands to mix until everything is evenly combined. Start forming the meat mixture into ping pong sized balls. I wanted at least 24, so I could have six servings of four meatballs. I ended up getting 26 meatballs. Heat a large skillet over a medium flame. Add 1 Tbsp olive oil, then tilt the skillet to make sure it’s coated in oil. Add the meatballs to the skillet and brown on all sides. This is a fairly quick process. You don’t need to cook them through, just until they are good and brown. They will simmer in the sauce later and finish cooking inside. In the same skillet, add the other half of the onion (also diced) and two cloves of minced garlic. Sauté in the leftover oil until softened. Add one 28oz. can of crushed tomatoes, 1 Tbsp tomato paste, 1/2 tsp dried oregano, 1/2 tsp dried basil, 1/2 tsp salt, some freshly cracked pepper, and 1 tsp brown sugar. Stir and heat these ingredients until the tomato paste has mixed into the crushed tomatoes. Add the partially cooked skillet meatballs back to the sauce and stir gently to coat them in sauce. Place a lid on the skillet and let the meatballs simmer in the sauce for 15 minutes (turn the heat down slightly if needed to let it simmer gently). While the meatballs are simmering, cook the pasta. To each bowl of pasta, add four meatballs and a scoop of sauce. 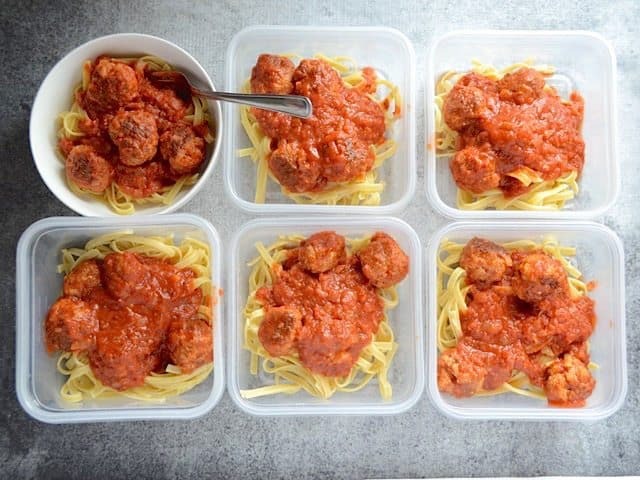 I portioned all of Skillet Meatballs and Marinara out ahead of time to make meal time easy. I may freeze a couple portions of this as well (but I have a feeling they’ll all get eaten quickly!). How much would you say a “scoop” of sauce would be? 1/2 cup? 1 cup? Hmm, probably about 3/4 cup. The sauce is mostly the tomatoes, which is 28 ounces, or between 3-4 cups.